Minimum Wage Hike Approved: What Else Do Employers Need to Know? California is the first state in the nation to commit to raising the minimum wage to $15 per hour statewide. Employers need to prepare for the minimum wage increase and examine other pay practices that might be implicated by the hike. Governor Edmund G. Brown Jr. yesterday signed SB 3 (Leno; D-San Francisco), a job killer bill that will increase the minimum wage in California to $15 per hour by 2022 (2023 for companies employing 25 or fewer people since there is a one-year implementation delay for small business). SB 3 calls for an increase of $.50 per hour beginning January 1, 2017 and an increase of $.50 per hour in January 2018. The rate would increase $1 per year thereafter until 2022. Small business would not be required to begin the scheduled increases until 2018. Once the minimum wage reaches $15 per hour for all businesses, wages could then be increased each year up to 3.5% (rounded to the nearest 10 cents) for inflation as measured by the national Consumer Price Index. Until the minimum wage reaches $15, the Governor has discretionary authority to suspend increases based on current economic conditions. However, these “offramps” are discretionary and would come into play only if there are declining state revenues from sales tax, a decline in the labor market or if there is a budget deficit (this offramp is permitted to occur only twice). California employers must pay employees no less than the state minimum wage per hour for all hours worked. Because California’s state minimum wage is higher than the federal minimum wage of $7.25 per hour, employers will be required to pay the state rate. When state and federal laws differ, employers must comply with the more restrictive requirements. The obligation to pay the minimum wage can’t be waived by any agreement, including collective bargaining agreements. The minimum wage rate change affects overtime. Effective January 1, 2017, employees who work for minimum wage and perform work that qualifies for overtime must be paid $15.75 per hour for time and one-half or $21 for double-time. This is an increase from the 2016 rates of $15 per hour (time and one-half) or $20 per hour (double time). For an employee to meet the commonly used administrative, executive or professional exemptions from overtime, he/she generally must earn a minimum monthly salary of no less than two times the state minimum wage for full-time employment, in addition to meeting all other legal requirements for the exemption. Under SB 3, that amount in January 2022 will rise from the current annual salary of $41,600 to at least $62,400, which is an increased cost to employers of $20,800 per exempt employee. Employers should be mindful of the effect of the minimum wage increase on exempt/nonexempt classifications and ensure that employees meet the salary basis test for the particular exemption claimed. Also, certain commissioned inside sales employees under Wage Orders 4 and 7 can be eligible for an overtime exemption. Generally, the exemption applies if the employee earns more than 1.5 times the minimum wage each workweek, and more than half of the employee’s compensation represents commission earnings. Employers will need to make sure that commissioned inside sales employees continue to meet this test after the January 1 minimum wage increase. Outside salespeople do not need to meet the minimum salary requirements. 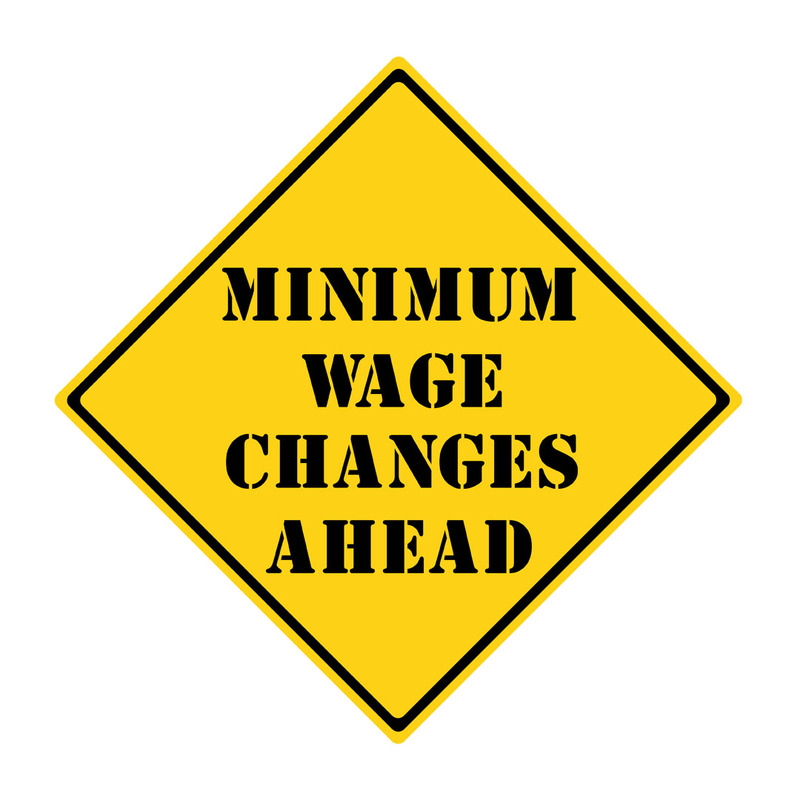 The minimum wage increase affects employer notice requirements related to the minimum wage posting, itemized wage statements and wage notices. First, employers must post California’s official Minimum Wage Order (MW-2014) in a conspicuous location frequented by employees. The current official notice includes the increase for January 1, 2016; however a new notice will be needed for 2017. Second, California employers must provide each employee with an itemized statement, in writing, at the time wages are paid (Labor Code Section 226). Among other mandatory information, the itemized wage statement must include all applicable hourly rates in effect during the pay period and the corresponding number of hours the employee worked at each hourly rate. NOTE: If an employee’s rate of pay will increase on January 1, 2017 due to the minimum wage increase, the employee must receive notice from his/her employer by January 7, 2017. The separate wage notice is not required if the employer has reflected the change on a timely itemized wage statement, if the statement meets all legal requirements. This is just a partial list of pay practices that can be affected by the minimum wage hike. For a list of other practices affected, see California’s Upcoming Minimum Wage Increase – Review Your Practices. Not a member? See how HRCalifornia can help you. In addition, a review of how to correctly classify and pay exempt employees will be presented by California Chamber of Commerce employment law experts in a live webinar on Thursday, April 21.